Looking to celebrate the love of your life on Valentine’s Day? What could be more romantic than sharing a bottle of sparkling wine? 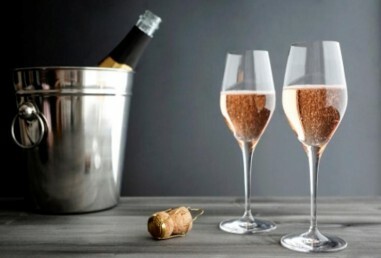 Prince Edward County is producing some fantastic sparkling wine and Sandbanks Vacations & Tours has compiled a list of some of their favourite County bubbly. These wines are available online at the individual winery or can be picked up on one of their tours. This is a fun, off-dry, delightfully fruit-forward bubbly named for the original way of making sparkling wine, the Ancestral is produced using similar techniques first employed by the monks of Saint-Hillaire abbey in 1531. Delicate bubbles give this bubbly a pleasant lift. Made from 100% Pinot Noir in the traditional French method where the bubbles are created in the bottle during the second fermentation and then rests for 12 months on the lees to add richness. A lovely elegant sparkler. As fun as it’s name this is a bubbly blend of Riesling and Chardonnay, with a touch of Zweigelt contributing flavour and the distinctive salmon colour. A lovely citrus on the nose with delicious peach, apricot character on the palate. From the first lot in a series of sparkling wine from the 2010 vintage. 12 months on the lees has brought out more of the classic brioche expected in a sparkler. Notes of white cherry and green apple and nicely balanced by wet stone minerality, crisp acidity and soft bubbles. 65% Pinot Noir 35% Chardonnay made in the traditional method. Using 100% Gamay grapes to produce this wine, it offers subtle aromas of Summer Berries with just a hint of white flowers on the nose. The Berry flavours carry on to the palate along with citrus and a minerality finish. The wine was crafted using the Charmat method and has very fine delicate bubbles. Sandbanks Vacations & Tours is your premier source for vacation rentals, cottages and wine tours in Prince Edward County.